Wildstar’s transition to free to play came on the heels of the game dipping down into virtually negligible revenues, $1.5 million as of the third quarter, and everyone wants to know how well free to play has treated the title. We won’t know the real figures until next month, but Daewoo Securities has issued a new forecast predicting that even a shift to free to play won’t be enough to save the sinking ship. Daewoo predicts zero turnaround for Wildstar, with Q4 revenues remaining flat and continuing to decline over the following months. For the fourth quarter of 2016, the company either predicts a statistically negligible amount or that the game will no longer be in operation. In addition, they predict that Heart of Thorns, the Guild Wars 2 expansion, has sold less than expected. We expect NCSOFT to report slightly disappointing earnings for 4Q15, due to 1) weaker-than-projected sales of the Guild Wars 2 expansion pack, 2) a lower-thanexpected increase in revenue from Lineage I microtransaction events, and 3) higher expenses related to marketing (G-Star trade show) and the company’s pro baseball team. 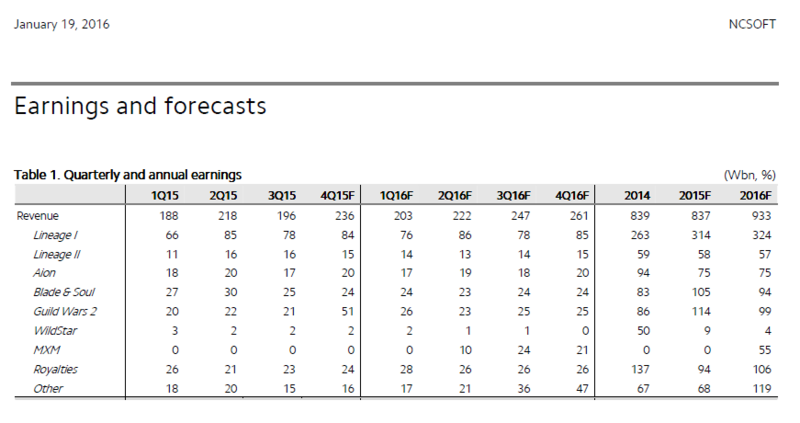 We forecast 4Q15 revenue of W236.1bn (+0.4% YoY) and operating profit of W70.8bn (-19% YoY). We’ll know how accurate this prediction is once NCSoft files their full report next month. Daewoo Securities correctly predicted that a Guild Wars 2 expansion would be released in Q3 2015 for $50 when neither a price nor even the existence of an expansion had been announced by Arenanet. Considering the accuracy of their predictions, I lean toward believing their sources.